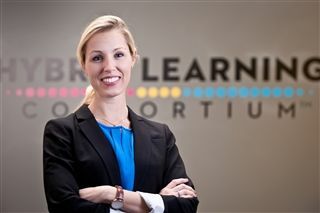 Sarah Hofstra launched HLC at The Barstow School in Kansas City in 2012, having recognized the need for relational and responsive online and blended learning. Since beginning this initiative, she has worked towards developing the collective and strengthening its programming among independent school partners. Sarah earned her Master of Arts in Education at Michigan State University, with an emphasis in Technology and Learning. She received her Bachelor of Arts in Elementary Education from Rockhurst University. MSU’s progressive approach to online learning framed her perspective that online and blended learning are the paradigm shift schools must make to be effective and sustainable. Prior to HLC, Sarah taught first and third grade, which impacted her belief that personalized learning is possible for all ages. Chris grew up in Oakland, California, and Kansas City and has lived in New York, Yokohama, Japan, and Melbourne, Australia. He completed a BA at Columbia University, as well as a Postgraduate Diploma in Arts (Japanese) and a PhD in History at the University of Melbourne in Australia. He has taught in universities and independent schools on three continents and, somewhat inexplicably, also spent several years managing a language school for a South Korean migration agency. In addition to supporting HLC teachers with course development, Chris teaches Globalization, Asian Studies, and Food in Human Society.